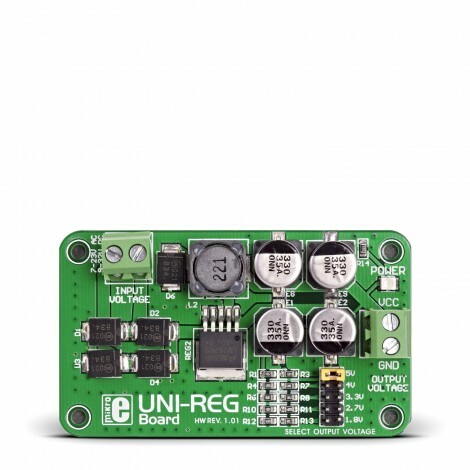 The UNI-REG Board features an LM2576 - a monolithic integrated circuit that provides all active functions for a step-down (buck) switching regulator, capable of driving various loads with an excellent line and load regulation. This board is ideal for the projects requiring conversion from higher to lower AC (DC) voltages. The board accepts 7-23V AC (or 9-32V DC) input and outputs a steady and stable 5V, 4V, 3.3V, 2.7V or 1.8V DC, which is suitable for most small electronic projects. Output voltage is selected via an on-board jumper.